One of the best prints from the set – a striking design with its deep perspective and shadows. It is fall with a full moon, and the theaters on the right are all closed as the season is over. The teahouses and brothels on the left are still open for business and some patrons are heading towards the only gate from the otherwise closed-in area. 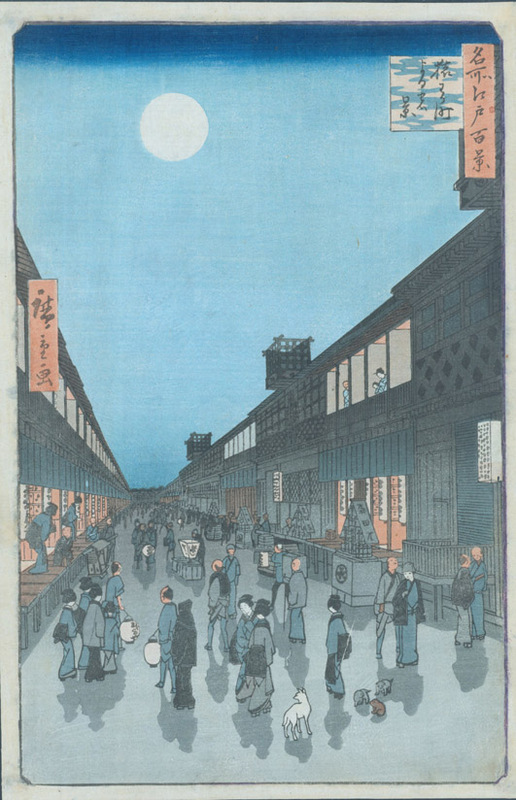 The avenue was where Edo’s kabuki and puppet theatres were rebuilt or moved after a fire in 1841. The name of the area is connected to the name of Saruwaka (Nakamura) Kanzaburo who is said to have been the founder of Edo-style Kabuki (all the theaters are there and the Nakamura-za is the furthest from view, the closest to the gate on the right). Oban Tate-e. Margins replaced and some in-painting.